Going postal in the U.S and Britain | Notes from the U.K. In my unending efforts to compare Britain and the U.S., I helped out with a bulk mailing on Tuesday night. Bulk mailing is an American term meaning “damn, we have a lot of paper here.” I’m not sure how you say that in British. Back in Minnesota, I was the entire staff of a very small writers magazine, and in the early years part of my job was to gather a crew of volunteers and mail the thing. Because it was cheaper to do a bulk mailing, we did a bulk mailing. (Hey, we were a nonprofit. Money was tight.) This involved crawling around the floor, attaching address labels, and sorting everything according to zip code, and it was this last bit, the sorting, where we’d get into trouble. Every month, I introduced new volunteers to the post office’s bulk mail regulations in tooth-shattering detail, but I never found the right words to make it all clear. That was because what we had to do ran off the edge of the English language. Irrelevant photo: The primrose path. Really. 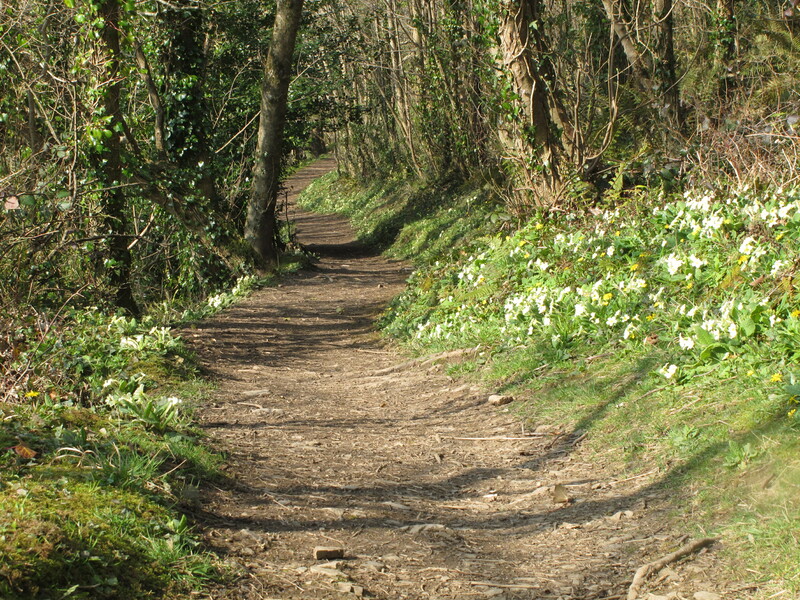 These are wild primroses growing along Lover’s Walk. I don’t think the flowers are why the path got that name. Lover’s Walk is one of the few paths in the parish where a couple stood any chance of finding a little privacy. It was something like this: If we had more than ten addresses in a single zip code, we’d band them together. If we have less, we’d combine it with others in nearby zip codes according to some complicated system I barely understood at the time and can’t come close to remembering now. Even if did remember, though, it ran off the edge of the English language so no explanation would help. Then we’d label the bundles and combine them in some equally obscure and incomprehensible way and dump them in canvas sacks, which again had to be labeled before we hauled them down the stairs and threw them in the back of my car. That last bit? The one that involved heavy lifting? That was the easy part. Then I delivered the sacks to the loading dock of the main post office and waited for the phone to ring, which it often did a day or three later. It would be someone from the post office would tell me to come back down, pull the sacks out of the canvas wheelie things they’d been thrown in, and fix the mailing in some obscure way I barely understood at the time and don’t understand at all now. Remember those new volunteers I said I had trouble explaining the system to? Well, none of this was their fault. If ever there was a system calculated to help me screw up, the U.S. Post Office had found it. Eventually the organization I worked for paid another organization to do the mailing. Whether that was for efficiency or mercy, I don’t honestly care. I’m still grateful, and the Minneapolis Post Office held a three-day celebration. No mail was delivered until the hangovers wore off. And now here I am on British soil, and by one of the universe’s little ironies, I was the one who organized last Tuesday night’s mailing. The Truro Post Office is hiring crisis counselors already and we haven’t even delivered the boxes. What we were mailing was called an election address (anyone but a post office would call it a leaflet) from a parliamentary candidate who has about as much chance of winning the election as I do of following complex instructions from the post office. Any post office. The candidate’s not running to win, although I’m sure he wouldn’t mind if he did, but to raise awareness of the way the National Health Service is being chopped up and privatized and underfunded. I won’t go off into a political rant here, and if you disagree, that’s fine, because the political bit ends here. The point is, even though he’s not running in our district, six friends and I thought it was important enough that we gathered to help out, together with one chocolate cake (which had no opinions on the subject and didn’t survive the night), many rubber bands, five or six kitchen scales, and an awful lot of paper. Parliamentary candidates in England (and I assume the rest of Britain) have the right to mail one, ahem, election address to everyone in their constituency (which I’d call a district, but I’m not in the U.S. now, so constituency it is). These don’t have to be individually addressed, mercifully, or we’d still be there, pasting and sorting and gashing our teeth. And probably, by now, throwing chocolate cake. But addressed or not, a post office is a post office, and it has its regulations. The leaflets had to be sorted into bundles of a hundred and banded. We could use either one rubber band on these or two. My instructions didn’t say what would happen if someone used three, but none of us was brave enough to try. Every last leaflet in the bundle had to face the same way. We weren’t sure if the bundles all had to be placed in the boxes facing the same way, so we made sure they did. We had 24,000 leaflets to mail, which I kept calling 2,400 and, occasionally, 44,000, which helps explain why I shouldn’t be allowed out in public but doesn’t explain why anyone let me to stay in the room while numbers were in use. Rather than count all 24,000 (or 2,400, or 44,000) sheet by sheet, the campaign office had told us to count a few initial bundles and weigh them, and that’s what the scales were for. A hundred leaflets weighed 792 grams. Except when they weighed 790 or 798, because kitchen scales aren’t as accurate as the digital displays make them look like they are. Or except when I’d drift into my dys-whatever-it-is that people allergic to numbers have, and I’d weigh out 992 grams and a few minutes later someone would ask why one of the bundles was so thick and reweigh it. Then the bundles had to go into boxes, all facing the same way, thanks, and each box had to have a printed label that included a blank spot for the number of leaflets inside. For the sake of our sanity, we put the same number of bundles in each box—twelve. Do you have any idea how hard it is to count to twelve? Never mind. We finished in time to eat the cake and all get home by ten. The boxes have to be dropped off on Friday—the day I’m posting this—at a tightly scheduled time, and the person dropping them off has to wear a hi-vis jacket and safety shoes. If male, he has to part his hair on the right and wear black-framed glasses; if female, she must not have used hair spray for two days prior to appearing at the post office and should wear contact lenses. I’m waiting for the post office to call me down to Truro so I can fix whatever I screwed up. A bundle deep inside one of those boxes has 98 leaflets. Or 102. I’ll have to unband and count them all to find out which one it is. The post office doesn’t have my phone number, but it’ll find me anyway. Some things that you do in life will follow you, no matter where you hide. This entry was posted in Intercultural Mayhem and tagged Americans in Britain, Americans in England, anglophile, Britain, bureaucracy, England, humor, post office by Ellen Hawley. Bookmark the permalink. Any monotonous task is horrendous; a monotonous task that fried your brain cells while simultaneously requiring you to following obscure but strict rules is even more horrendous. Well done for doing your bit in the fight to save the NHS though. Thanks for that. The NHS is a wonderful institution. It makes me want to scream, what they’re doing to it. I agree. It’s one of the best things about Britain, something to be proud of. I miss it terribly. Yes. Life in the land of private insurance can be frightening. While you were crawling around on the floor looking for labels, I was inside the Post Office (working my way through college) sorting random bits of mail from boxes and businesses into similar piles, neatly bound and tossed into canvass sacks hanging in long racks. Everything went out, every night at 9:00. The sack might only have one bundle, but it went in the truck and the tag tied around its neck indicated that there must be a bundle in there. I used to pick up mail from a bulk mailer in our town. I was amazed at how well they understood the rules. I doubt there was anyone in our office who could question them. Thanks for the memory jog. Oh, yeah, I do remember putting one thin bundle into a big ol’ canvas sack and thinking it looked kind of lost in there. If the bundles you worked with were neatly bound, you were nowhere near the ones I was responsible for. For better and for worse, I didn’t do bulk mailings often enough to really get a handle on them. If I’d done them every day, even I might have become competent. If I hadn’t done them at all, the Minneapolis Main Post Office would have been a better place to work. I did it for three hours a night, every night for 89 days, so practice made adequate. In some things, that’s the best we can aspire to. In others, it’s more than we have any chance at. I can live with having that effect on people. It does solve a lot of problems. And create a lot of others. Holy cow! What mailing adventures you’ve had on both sides of the Atlantic! PS I love the Lovers’ Lane photo.. So pretty! It’s a beautiful stretch of path. Enough to convince a person to fall in love all over again. In a more buttoned-up time, I expect it was–extremely. And it ain’t at all bad in these more unbuttoned times either. This is almost painful to read. I don’t know how you managed to do all of that. I would go insane. Love the part you made up – brilliant! Did I make part of that up? It’s always good to know about something like that. At the worst of times, you can think, At least I never had to do a bulk mailing. Yes, I can see it working that way, although I confess I wouldn’t have thought of it.